The annual Consistory Feast, and Scottie Awards, is coming up fast. On May 15th, 2014 we will be presenting to the brethren of the Minneapolis Valley and their guests, our version of the Oscars. 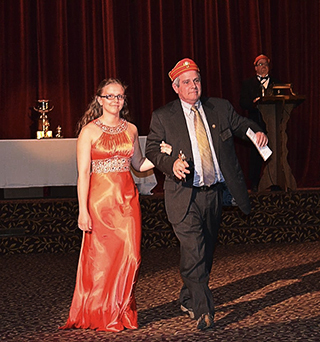 Our Scottie Awards is the ONLY program of its kind in all of Scottish Rite Masonry. This program was started by Ill. Frank Ronich, 33º, and Ill. Ed Perlman, 33º. Ed is great at thinking of ways to inspire people and keep our membership alive. Frank was a phenomenal ritualist. His insight as to what these degrees are to portray and the ability to instill this in the brethren that perform the various roles along with adding music and special effects, have transformed the various degrees into class A productions. With this in mind, they thought the Brethren should receive recognition for their hard work. There are awards for Best Actor, Supporting Actor, New (Neophyte) Actor, Best Director, and many more. There is also the Frank D. Ronich Lifetime Achievement Award. This award is presented to recognize one individual for his Lifetime of contributions, not only to the Minneapolis Valley but to Masonry in General. This year we will be upgrading our service with a spectacular dinner choice of either Prime Rib or Salmon, rolls, salad and dessert. There will be a cash bar during the social hour and a lot of great hors d’oeuvres. All of this for a mere $30. I hope you will all make the effort to attend and fill the sidelines, making this year’s awards something special for the recipients. Remember these Brothers have put in hundreds of hours of work and this is our way to say thanks. Reservations are required and can be made by calling the office a 612-871-1500 or email to office@scottish-rite-mpls.org .